Can You get an Android Tracfone? 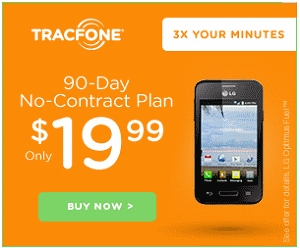 Android Tracfone Handsets Finally Available! Can you really get Android Tracfone handsets now? Yes, you can, finally, and they're not expensive. So how much will it really cost? Well that depends on how much data you will use over the cellular network. At some point it may be cheaper to go with a Straight Talk or Net10 phone instead. But first let's take a look at the phones, and there are a whole slew of them. Premier phones like the Samsung Galaxy S7 and S6 are finally available direct from Tracfone but at a high cost: $629 and $529 respectively. However, you can also get a smartphone like the LG L16C (Lucky) for free with airtime purchase. There are also 4G LTE phones available for as little as $30. Quite a few other phones have been added to the line-up along with a few price drops along the way. Scroll down below for the full list and their important features. Okay, so the Galaxy S7 is now directly available from Tracfone for a mere $629. This comes just few weeks after the S6 was finally also available. The Galaxy S6 is the first premier phone (though the S7 has been released) to be available directly from Tracfone. You could, of course, have activated an unlocked S6 via their BYOP program, but this particular phone is configured as a Tracfone only, which presumably means that you cannot activate it on any other plan, not even its sister plans, Net10 and Straight Talk. Given the cost, you have to be sure that you're definitely going to use it as a Tracfone for at least a year or two. The features themselves, of course, are very good. There's a 5.1 inch HD display. It feature a 16 MP/5 MP rear and front-facing cameras. This is a 4G LTE phone, which is great, but you have to balance that with the cost of data on the smarphone plans. You can get the Samsung Galaxy S6 here. Ok, so the Galaxy E5 is apparently a stripped down version of the S5. It is still a 4G LTE phone with a 5.0 inch display. However, compared to an S5, the E5's display is lower resolution. Likewise, the 8MP rear camera is half the resolution. Finally, it has 1.5 GB RAM (which is still pretty good for a Tracfone) as opposed to the standard 2GB RAM memory on the S5. The price is pretty good, though. 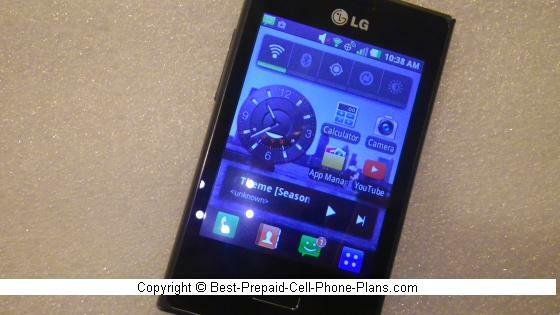 The LG Sunset is the first 4G LTE phone from Tracfone,and you can now get it from them directly for 99.99 (price drop). You may also be able to find it in select retail stores. The Sunset has 4.5 inch screen and runs Android 5.0 on a quad-core processor (another first for this plan). It still has only a VGA-resolution front-facing camera to with the regular 5MP rear-facing camera. The Pixi Pulsar has very similar features to the Glitz such as being 4G- capable but with only a 2 MP camera. However, it does have a 4 inch screen which may account for the higher cost. The Pixi Eclipse has almost the same features as the Pulsar, but it runs on the Verizon 3G network. It does feature a HAC M4/T4 rating unlike most phones which only qualify at T3. You can choose from a few different handsets with front-facing cameras: the new ZTE Zephyr, Samsung Galaxy Stardust, LG Ultimate 2, LG Sunset, LG Power and the Alcatel OneTouch Pop Icon. Other handsets available now or previously include the Moto e, LG Optimus Fuel, ZTE Valet, the Samsung Galaxy Centura, the LG Optimus Dynamic II, the Unimax Patriot, and the Huawei Glory. The Samsung Galaxy Stardust is the latest addition to the line-up. It features a 5MP camera (0.3 MP front-facing). It has a 4-inch screen and runs version 4.3 of the Android OS. This phone has 8MB internal memory and is capable of using 64GB external memory cards. It comes with the Norton Family Controls app and also features Glympse which allows you to share your real-time location according to your preferences. The LG Ultimate 2 is an Android 4.4 device with a 4.5 inch touchscreen display with a 5 MP camera and a 1.3 MP front-facing camera. For the last few days of the holiday season both the new and reconditioned versions are on sale at the same 49.99 price! The LG Power is an Android 5.0 phone with 4.5 inch screen and a VGA front-facing camera to go with the regular 5MP rear camera. It is also a 3G phone with, of course, WiFi access. It is priced at the same 89.99 price point as the ZTE Zephyr. However, the reconditioned LG L22C is just 19.99, a bargain. This appears to be the GSM version of the above phone. Features are pretty much the same. Note that this phone has a quad-core process which should make things pretty snappy. The Alcatel onetouch ICON Pop Android actually has a bigger touchscreen - it's 5 inches. It also has a 5 MP camera, but the front-facing camera is only 0.3 MP (VGA quality). It seems to be fairly popular phone as it goes in and out of stock. Its price remained stable at $149.99 for a long time, but has recently been lowered to 99.99 (59.99 reconditioned). It is also available from Net10 and Straight Talk, though those versions require the unlimited plans which do cost a bit more per month. The ZTE Citrine is a budget-priced LTE phone running Android 5.1 with a 4 inch screen and 5MP camera. It does have a basic VGA front-facing camera as well. The ZTE Paragon on the other hand is listed as "4G-capable", but not as an LTE phone. Otherwise, its features look to be the same as the Citrine. The ZTE Quartz is notable for its 5.5 inch IPS screen. It has an 8MP camera (1MP front-facing) and a 1.2 GHz dual-core processor. Worth it for the screen and camera. The ZTE Zephyr is an Android 4.4 handset with a 4-inch screen, 5MP camera (0.3MP front-facing) and a 1.2 GHz processor. (Assuming the description is accurate as they're still updating the site and some mention of another phone, the LG L161C is mixed into the description). Still, this is the least expensive handset in the line-up (and in stock) to have a front-facing camera. The ZTE Whirl 2 is an Android 4.3 phone with 3.5 inch screen, 3 MP camera and a 1.2 GHz quadcore processor. It is listed as a 4G (not LTE however) phone, and that would appear to be its main attraction. The Moto e comes with a 4.3 inch qHD display with Gorilla Glass. It runs version 4.4 of the operating system and has a 5 MP (fixed focus) camera and FM radio. The battery is supposed to last a full day which is good for a smartphone. The LG Rebel is an LTE phone with a 4.5 inch screen, 5MP/2MP rear- and front-facing cameras. This runs Android 5.1. The Optimus Fuel is an Android 4.4 phone with 3.5 inch screen. It is a basic smartphone but at least it runs a recent version of the OS. The SpongeBob Squarepants™ version is also available and comes with a set of special earbuds and includes access to games, apps and episodes of the (primarily) animated show. This version is now priced at $29.99 when available. The box shows that the phone is designated as "CDMA-V" - which indicates it runs on Verizon's CDMA network. The LG Lucky, like the Dynamic II, has a 3.8 inch screen and a 3MP camera. However, being newer, it does run version 4.4 of the Android operating system. LG Sunrise (L15G) 29.99 for Teenage Mutant Ninja Turtles version (out of stock) or $9.82 for plain version (from Walmart). The LG Sunrise is a 3G phone with a 3.8 inch screen. It does run version 4.4 of the Android operating system which is fairly new. The camera is still only 3MP resolution however. Still it may be worth it for the bargain-basement price. Tracfone is selling it in two versions. A regular version designed more for adults, and a Teenage Mutant Ninja Turtles version designed for kids or those nostalgic about the show. This version includes a TMNT phone case and an app download. The LG Optimus Dynamic II has a 3.8 inch screen which was the largest until the introduction of the Alcatel model and the Ultimate 2. The other features are still pretty modest (3 MP camera etc.). It does run version 4.1 of the operating system which means you should be able to run most of the latest apps. The Galaxy Centura S738C is the other smart phone offered. Its specs are actually slightly weaker although it has been priced higher in the past. For example it has an 800 MHZ processor and runs version 4.0 of the Android operating system. The other specs are pretty similar in terms of the camera and screen. Samsung is a more familiar and trusted name, and that may explain the price difference. 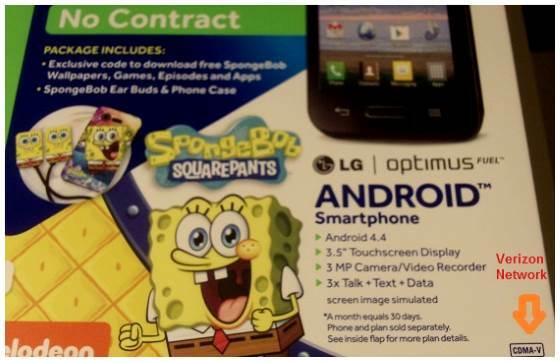 There is a SpongeBob version of this phone as well (first spotted at a Walmart store). The design of the package was not as bright and colorful as with the Optimus Fuel. However, you do still get a special set of earbuds and a free movie download. Here's a tutorial of the Straight Talk version of the phone (which should be pretty much the same). 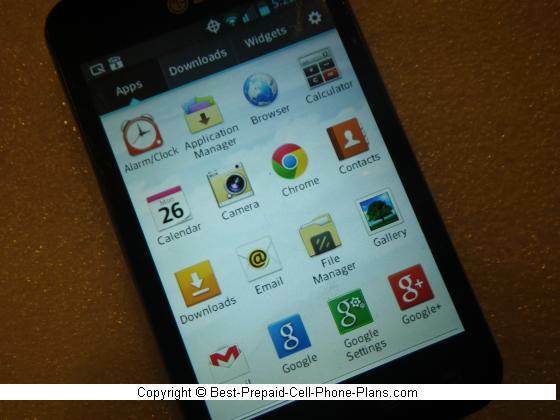 The UNIMAX MaxPatriot is an Android 4.1 phone with a 4-inch screen and 5 MP camera. Don't know much about it yet. The "Details" screen still has a subheading that reads "LG Optimus Dynamic", so they must have put it up in a rush, however the rest of the details seem to match, so I think the above is correct. This handset was originally introduced at 69.99 but has been reduced. Get the UNIMAX MAXPatriot for $19.99. 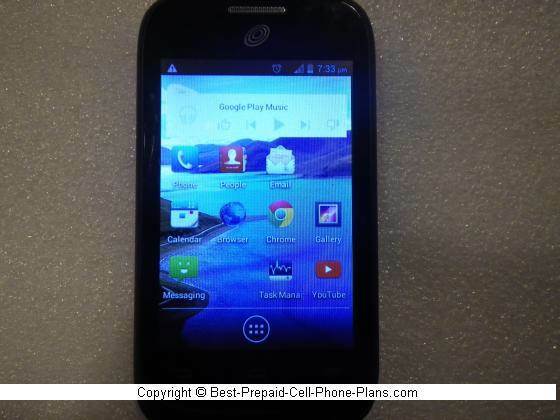 The ZTE Valet is an Android 4.1 phone with a 3.5 inch touchscreen, 3 MP camera and has a 1 GHz processor. The Operating System is relatively recent, so you should be able to run most of the apps available today. Some features are clearly a compromise. The camera is not of the highest resolution, but there is a flash, and the resolution is still better than what was available before (with the exception of the EX124g). The screen resolution is listed at 480x800 though there seems to be some debate over how accurate that is. The phone is now listed at 9.99. See Manual and Tutorial here. You can order the phones here. The Optimus Dynamic comes in black and white and is the only Android 2.3 phone in this lineup which makes it a bit dated. However, it is fine for for basic uses such as checking Facebook. It's a good option for kids if you want to limit the number of games they download! It is also on the Verizon network. The black version is back in stock and available for free with airtime purchase. The NET10 version is still available, but you have to use it with a NET10 plan. The Glory runs version 4.0 of the OS, has a 3.5 inch screen and a 1 GHz processor. When I check out the Tracfone site, it's often displayed at the top of their listings indicating either that it's popular or that they're really trying to sell it. These phones are triple minutes phones, but the airtime cards work a little differently when added to these phone. Like all other triple minutes phones, when you add an airtime card your minutes are tripled. However you also get a separate allotment for texts and data. In fact there are three separate buckets for minutes, texts and data. So let's say you add a 60 minute card. You then get 180 voice minutes, 180 texts and 180 MB of data added to your phone. All of these items carry over. Note: all these phones do have WiFi-access which is always available as long as you're connected to a WiFi network. If your data usage is high enough, you can add to your data bucket by adding data cards which come in denominations of $10 for 300 MB, $15 for 750 MB, $30 for 2 GB, and $50 for 4GB. The data doesn't expire as long as your regular airtime cards (see above) are active. This also means that any data you have rolls over. So you can start with the $10 card to test out the system and then go for the cheaper rates offered by the higher value cards. As long as you don't watch video using cellular data, I find that the data cards last a long time, which means it's actually feasible to use one of these handsets as your regular smart phone. You can also buy airtime cards designed only to be used with their smartphones. These come with a higher amount of minutes, but these don't get tripled. The cards range from $35 for 500 minutes to $90 for 3000 minutes. They also have varying amounts of data that don't exactly match the number of minutes. These cards have a 90-day service period. So I was curious about what happens if you have a regular Tracfone such as an LG 840g and want to transfer your minutes on that phone to one of the new phones. The old handsets only come with one set of minutes that get used up when you call, send a text or surf the web. I couldn't find the answer on the website, so I called up customer service. Minutes converted to minutes plus data and text. I asked the customer service representative what would happen if I had a regular handset such as the S425g with 400 minutes and transferred those minutes to one of the Android handsets. The agent answered that those 400 minutes would be converted to 400 voice minutes, plus 400 text messages and 400 MB of data! I think this is a great reason to switch over. You can get these Android Tracfones from the provider here. For now, you can still use a promo code to save $5 off the list prices. You do have a few other options for no-contract smartphones, especially if your data needs are higher. Straight Talk is one of Tracfone's sister brands, and it carries a nice selection of smart phones. The cost is $45 per month. These phones run on a number of different networks giving you a choice not generally available elsewhere except at NET10. Kajeet offers a number of Android phones and iPhones with parental controls for safe use. Their smart phone plans start at $24.99 per month.